Documentation of existing tent settlement in Çınar camp, Diyarbakir, by Ashraf Nassab. Produced within Architecture Master Studio, MAU Architecture Faculty, 2016. What trans-local commoning practices could exist between urbanized camps such as Dheisheh or Al-Fawar in Palestine and those recently established in Turkey? How can we redefine and experience the infrastructure of thresholds, commoning practices and methods of experimental heritage that emerge within them? And how might architectural and design pedagogies provide a common base for such understandings? Distinct geographical conditions, socio-political forces and uncommon histories make cumulative interpretation and analysis difficult. This uncommon knowledge is, however, exactly the way in which methodologies can be expanded and concepts redefined. The anachronistic forms of refugee camps lead us towards a new understanding of dwelling, one that is not grounded in practices of “empathy,” but rather of knitting the commons. Highly secured tent and container camps first started being built in Turkey by the Disaster and Emergency Management Presidency (AFAD)—a Turkish state administrative body operating with UN support—in 2013 to house refugees from the Syrian civil war. At the same time, many self-organized or NGO organized camps began appearing, such as in occupied bus terminals building or vacant spaces in between towns or urban neighborhoods. 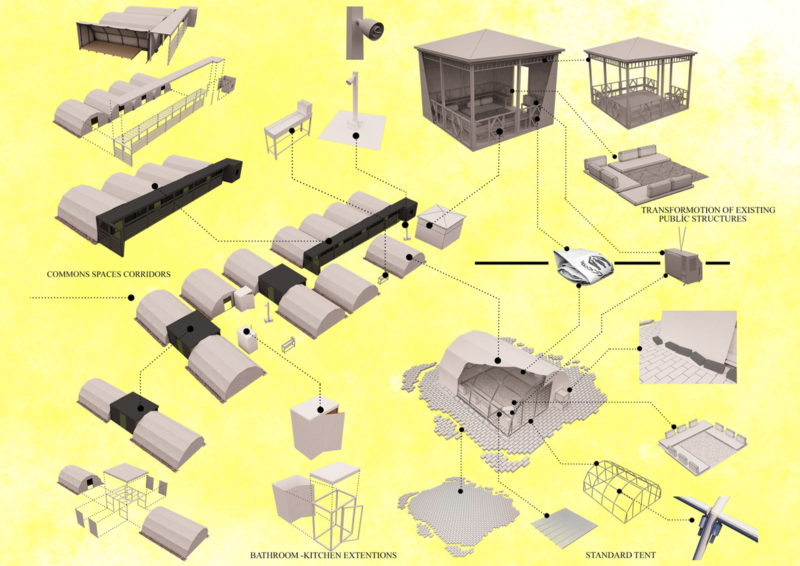 In both types, refugees have reorganized and adapted these spatial environments according to their everyday needs and respective backgrounds. Since 2013 I have run postgraduate design studios at the Architecture Faculty, Artuklu University, Mardin, in which we have documented and archived processes of self-organization and design in various camps, such as Calais, on the English Channel in France, to Al-Fawar and Pikpa in Lesvos, a Greek island 4km from the Turkish coast, and Midyat in Mardin, just 25km from the Syrian border in southwest Turkey. We have focused on the question of autonomous, interdependent infrastructures and commoning practices from an architectural perspective, which has led us to the camps’ heritage, both tangible and intangible. According to Silvia Federici, commoning practices require community, which in itself is based on relations with the principles of cooperation and responsibility to one another.⁶ Examples like Pikpa camp in Lesvos—which serves more a space for safe passage rather than one of confinement—or City Plaza Hotel in Athens—an occupied space where refugee families and Greek activists together act as one—are thresholds evolving within co-existing communities. But in many refugee camps, ethnic identity and religion often act as the basis for community networks and formative relations. While this can result in social structures that leave certain inhabitants vulnerable, design can be used to ameliorate, or even subvert such conditions. Ezidi women in Çınar camp, for instance, are prohibited by their husbands to sit in front of their tents. As a response, they have built semi-public extensions to their tents from found materials like wood, blankets and humanitarian-grade plastic sheeting. While in different and at times conflicting ways, each of these cases demonstrate Federici’s claim that commoning practices not only have the ability to overcome vulnerability and precariousness, but also highlight the role of women in their becoming. 2 Further notes forthcoming in Turkish: Pelin Tan & Ömer Faruk Günenç, “Camp: Decolonizing Architecture” in: Yapi Mimarlik Dergisi, (Yapi Endustri Merkezi, Istanbul: 2017). 4 For a more expanded discussion on the topic, see: Pelin Tan, “Architecture in Crisis: Exception as a Form of Decay”, ARQ, 92, 2016: pp. 118-125. 5 Pelin Tan, “The Unconditional Experience of Space,” in: The Unexpected Guest – Art, Writing, Thinking of Hospitality, eds. Sally Tallant & Paul Domela, (Art Books Publishing Ltd, London: 2012). 6 Silvia Federici, “Feminism And the Politics of the Commons,” The Commoner, ➝. 7 Elizabeth Povinelli, Geontologies (Duke University Press: 2016), 5. 8 Cyrille Hanappe, an architect who has worked with students in Calais, is another example of how architectural methodologies can be pushed beyond a humanitarian approach and deployed as a form of research. See ➝. Berat Celebioğlu, Derya Dağ, Hülya Irmak, Ferda Ocakhanoglu, Elif E.Yilmaz. 10 See, for example, the Campus in Camps publications “Common II,” “The Square” and “The Bridge,” ➝. Pelin Tan is Associate Professor at the Architecture Faculty, Mardin Artuklu University, Turkey.